I feel like I should post since Karl was nice enough to link my blog and say kind things about it! The internet doesn't need another "sorry I haven't posted in a while" blogs so I'll just skip past that. Life has brought about a lot of changes this year. I just became and uncle and I started dating the most amazing woman I've ever met. That wasn't enough change so I decided to get engaged, start planning a wedding, and look for a house for us to buy as well. Whoa. In terms of guitar, the biggest change will be moving to a smaller house. Currently I live with 3 other guys who are all musicians and we have a 20' x 20' room full of recording gear, drumsets, bass rigs, guitars and amps, a fender rhodes and a hammond B3. I have lots and lots of stuff in that room. I won't have room for it and honestly I don't use a lot of it so I've been selling stuff off. I'll be taking my amp, three electrics, an acoustic, my pedalboard (plus a few extra pedals), and the rhodes with. Everything else is going. In the downsize, one of the things that crossed my mind was selling my amp, cab, and pedalboard and replacing it with a digital modeling system. I couldn't bring myself to do it, though. Not because I'm against modelers but because I really like what I'm getting with my current gear. Why fix it if it ain't broken? However, I did decide two things: 1) If I didn't have any gear and I was starting from scratch I would go digital and 2) when my amp dies I will most likely switch. My amp is 38 years old, it will die someday and I have it insured so even if it just dies of old age I'll still get the appraised value, score! So, what should I get if my amp died today or hypothetically I didn't own any gear? 1) It has to sound good. Not "people falling to their knees that single note sounded so sweet" good. Maybe 90% that good. 2) I has to keep presets and have a simple layout so with two or less buttons I can bring up a new song with a new tempo. 3) It has have great delay, light overdrive, tube screamer (solo), and high gain - or let me input my Tim, TS808, and OCD. 4) It has to model a Superbass/Bassman and AC30 well. Bonus if it models a bluesy fender. 5) It has to be significantly cheaper and/or easier to transport than my current set up. Otherwise, what's the point? 6) Has line out to the sound board and the option to go out to a solid state power amp with a speaker. I was being so good! I hadn't bought a piece of guitar gear in 9 months. Considering I built me rig from nothing in the previous 3 years... that says a lot! The key to not buying gear is to stay away from the gear page and craig's list. I know the rules, but the other day I slipped. I went on to CL innocently enough, I wanted to see if anyone was selling Ikea shelves so I could get them cheaper. as soon as I had typed craigslist.org my fingers just naturally finished with "/msg". Oh well, now that I'm here I might as well see what the gear world is doing. "awesome vintage squire -$200", pass. "Free huge grand piano if you pay $400 to have it moved", pass. 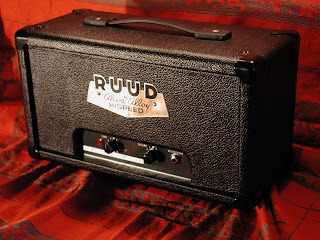 "Hand Built Point to Point Super Charged Tweed Deluxe Style Tube Amp", Oh? What's that? Click. 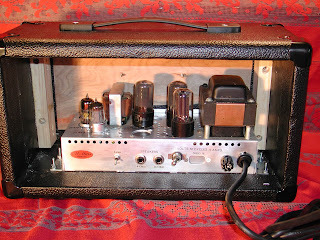 Hand Made, Hand Wired, Point to Point all tube guitar amplifier. This amp is much like Fender's late '50's Tweed Deluxe. Two 6V6 in a push pull configuration, 12AX7 driver/phase inverter and 12AT7 in the preamp position. Although this amp is much like a tweed deluxe, significant tweaks have been made to make the amp more usable and more fun. The amp is in the head configuration, so you can use any speaker combo you like. The amp has 8 and 16 ohm speaker taps. One volume and one tone control and a fat/lean switch to accommodate a variety of pickups. Additional circuit alterations have been employed to make the amp "hotter" and more dynamic than a stock 5E3. Very touch sensitive and versatile for a simple amp. Quite loud for 15 watts. Pure tone. Built into an old film projector chassis. No circuitry from the original Filmosound (because stock filmosounds sound awful). All new quality components, 50 year old iron, old stock tubes. I think I've mentioned before that ever since I got my Tele (G&L) I've wanted a Fender style amp. I just hadn't found the right tone/price combo. I was pretty excited to try this amp out. I went over last night and it sounded good! I brought it home but one of my roommates was sleeping so I'll have to wait to hear it with my pedals and cab. Right now I'm going to use my 2x12 with scumback's but I'd like to get a 1x12 with a Weber 12A100 (clone of a Jensen P12R).